Nissan Teana I. TheRing Rectangular Driving Lights are slim-line lights for bumper or spoiler mount. They are easy to fit and include halogen bulbs and brackets. Ring Rectangular Driving Lights Extra Info. Nissan Teana I. Matt headlights present a serious safety risk. In addition, naturally, clear and well maintained headlights also contribute to the appearance of the vehicle and, thus, the value retention. Nissan Teana I. TheRing Rectangular Fog Lights are slim-line lights for bumper or spoiler mount. They are easy to fit and include halogen bulbs and brackets. Ring Rectangular Fog Lights Extra Info. Ring Rectangular Fog Lights. Nissan Teana I. Perfect for the Winter Nights, Made from top Quality high impact ABS so will not Rust. For mounting above or below the bumper, complete with 2 x 12 volt 55 watt H3 'E' approved powerful Halogen bulbs. Will pass on MOT. 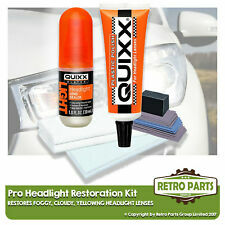 The flexible plastic adheres easily to flat or curved lens surfaces on either rear lights or turn signals. For quick and easy repairs, simply cut the film to size, remove the adhesive liner, and apply to the broken automotive light lens. Luz Señal Giro Cinta de Reparacíón Faro para Nissan Teana i. Mot Pase Fix Ámbar. Cinta del indicador de luz Ambar lente reparación automotriz para unidades de lámparas agrietado/agujeros. Trabaja con todos los años y motores automotrices lente reparación cinta-Amber -1mtr. freno / luz antiniebla Unidad Cinta de reparacíón faro Kit para NISSAN TEANA I.
Para cualquiera que se pregunte cómo arreglar una luz trasera rota, es bueno saber que esta película la reparación de la lente de la automoción es fácil de usar con básica de cómo hacerlo habilidades de reparación de automóviles.